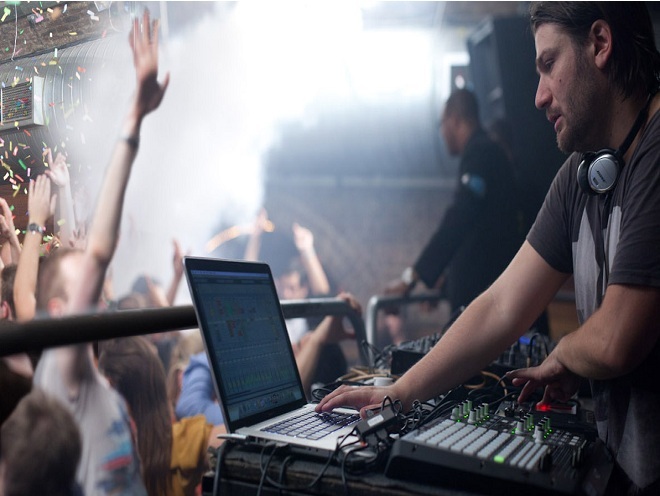 His live show, using assorted hardware, has caused a ruckus at various parties across the world, including Space Ibiza and London’s Fabric and he was recently nominated for the 2012 DJ Mag Best Live Act award! Added to this, his 2012 live album on Cubism received critical acclaim across the board and his E.P releases on such labels as Soma , Bedrock ,Lucidflow, Wiggle , Monique Musique and Bulletdodge, among others, have found their way into the sets of some of the scenes hottest DJs. Firstly, congratulations on the recent birth of your first child, how are you finding fatherhood? Loving it , its the best thing in the world! That’s not to say it doesn’t come with its challenges sleepless nights upon sleepless nights from touring make life very tiring at the moment ! Amidst the prevailing culture of the “Producer/DJ” you’ve always made it clear that you’re a live artist and most certainly NOT a DJ, why has it been so important for you to maintain this distinction? Simply because its the truth and in this industry most people assume your DJing , which I am not . I’m performing my own music live and improvising, not DJing with my tracks or jamming over other peoples tracks which seems to be the assumption. Its a message I really have to ram home with the press and even some promoters. That’s not to say I have anything against DJing in fact I love listening to mixes and respect DJs its just not what I do! Simply Underground house and techno, I like to think its got depth and soul and it certainly comes from my heart. Who have been your biggest influences/sources of inspiration musically? Wow so many to hard to put em all down I love music everything from classical to dub , jazz to 60’s rock … I have been hooked on electronic music for 20 years now so so many great tracks, albums and DJ sets to draw influence from. Please tell us about your live/studio set ups, and which bits of kit are your favourite? Roland MC909 which is a great bit of hardware for jamming with synths , sampler , drum machines all in one performance friendly box . Kaos Pad 3: great for drawing in fx , sweeps and jamming out delays on. Customised Akai APC 40: For triggering samples and tweaking soft-syths and fx also use It a bit to mix live in ableton. Ableton 8: Needs no explaining , I always use scene view in my live shows with no pre-arranged bits everything is triggered as and when. Maschine Mikro :love maschine for making beats haven’t integrated it into my live show just yet still just for production! Pioneer RMX 1000: Great effects and have loaded my own samples in it for creating live drum & stab patterns. DJM800 or 900 for mixing it all together. I don’t really have a favourite. Everything plays it part in the live show I also sample the hardware for finished productions . I always think you must have a strong back, carrying all of that gear with you to all your gigs! Do you ever encounter any problems getting it all transported around, and is setting up at venues more used to DJs ever an issue? It all packs down nicely into a flight case and a ruck sack so not so hard … the promoters supply the mixer. I have had one issue with a venue in Kent , its was more of a meat market disco affair who where trying to do an underground night on thursdays. The promoter stitched me up properly phoned me up when I was at the station to say the club wouldn’t allow the live show and never paid me a penny. It was a terrible club I should have never taken the booking! All the top clubs and promoters who love the music are really good with this stuff. Things seem to have really blown up for you over the few years or so, why do you think this is and what have been your highlights so far? I have been really focused on my career and have fought my personal demons. In terms of highlights For me performance is very satisfying especially when you play to a good crowd its very rewarding to make that connection with a crowd of music lovers, also I love the feeling of finishing tracks or a live album after working hard. You’ve been very open about your past problems with drugs and mental health issues, do you feel that such overcoming such adversity has served to make you stronger as a person? Yeah I have been clean & sober for 4 years and have discovered I have Aspergers and adhd , so I went though quite a few years of addiction , depression and anxiety mainly due to being on the autism spectrum and being undiagnosed I was just considered a problem child at school so found drugs at a very young age and basically took it to excess. Some people hate labels but they have helped me to identify my problems and work on myself … now my life is good my mental health is good and I actually enjoy being on the spectrum it comes with benefits like single-mindedness, focus, high IQ, and specific skills. What has been your proudest achievement in music so far? I have played venues I have always dreamed about I mean to perform live in room one of fabric or the terrace of Space Ibiza is a dream come true. Also getting nominated best live act by DJ MAG and getting such support from the press and DJs for my Albums and Singles. You recently said that many underground DJs have impressed you recently, which names spring to mind and why? Too many to mention, I love great DJs and now is a really exciting time. Whilst you have a lot of vinyl purists bashing a lot of the new school of DJs. I have found that the new generation by enlarge are a lot more creative than those before them. Using technology to work effects and remix tracks live. Exciting times. Please tell us about your forthcoming tour dates, and the ones you are particularly looking forward to. Check out www.sayteklive.com for the latest listings. I have shows confirmed at clubs and festivals across the UK and Europe, and currently waiting for my first Ibiza dates & return to fabric. Finally, what would be your advice for aspiring artists and producers? Make the music from your heart, don’t follow the masses that’s what everyone else does!